Adventure Playgrounds are currently on my mind alot and mainly because I am running a project about play – Best Days of Our Lives. Which incidentally I didn’t name and not sure I agree with as a statement but it’s incredible that whoever I speak to about their childhood playing, respond with wide smiles and urgent recalling of weird names for weird, made-up games. Slade Gardens was the one I grew up on and presented the scary excitement that kids are are always looking for. I was maybe 3 or 4 when I first entered this massive world that felt like it was for the bigger ones but having an older brother would grant me access…there seemed to be no rules, I wasn’t sure if anyone was looking out for me and how the eff was I ever going to get across the wobbly bridge on my own? Adventure Playgrounds came about mainly after the second world war when places to play where limited and makeshift. To me, they always look wild and daring and that’s because many are led by the kids themselves so don’t follow any guidelines or aesthetic. Just high quality fun, that is often dirty. Kids rule these places and throw out adult ideas of structured play. I cannot wait. 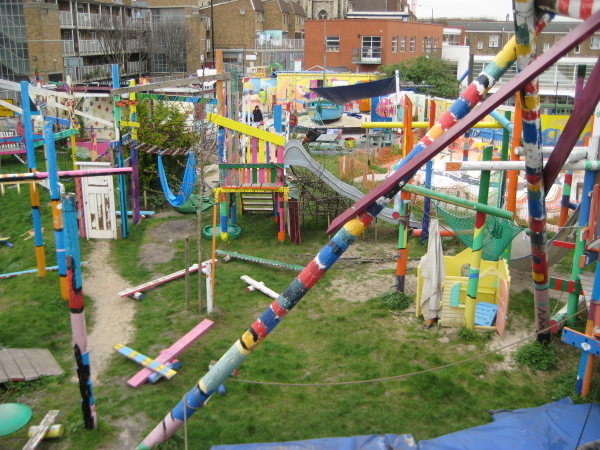 I just cannot wait to go to Glamis Adventure Playground which is around the corner. G just started walking and so I think that’s the right age for him to get stuck in. Yes, having children allows you back into these worlds – maybe only briefly and then you get relegated to the pub or the shops so you can leave them to it. Penny Wilson is a Playworker at Play Tower Hamlets and wrote this about Glamis which really gets the heart beating.